THE EMERGENCY POWER PACK CAN BE USED T5/T8 FLUORESCENCE. THUS ALLOWEING ANY LIGHTING SPOT TO BE QUALIFIED FOR EMERGENCY IN A SIMPLE AND QUICK WAY, WHERE NEEDED. 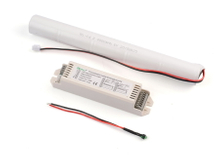 THE LED EMERGENCY LIGHTING KIT ARE DESIGNED ACCORDING TO EN61347, EN55015, EN60598-2-22, EN61000. Meibang Electric (kunshan) co.,ltd. is a professional leader China Fluorence Tube Emergency Kit,led emergency light conversion kit,LED Emergency Drivers,emergency ballast for led tube,led emergency ballast,led emergency kit manufacturer with high quality and reasonable price. Welcome to contact us.